With heavily favored River Boyne bottled up late, longshot True Valour rallied from off the pace to take Saturday's Grade III, $100,000 Thunder Road Stakes by a half length while providing trainer Simon Callaghan with his second stakes win on the day and Italian-born Andrea Atzeni, 27, with his first ever Santa Anita stakes victory. A 5-year-old Irish-bred horse, True Valor got a flat mile over a “good” turf in 1:36.35. A close fifth and on the move around the far turn, True Valour wheeled three-wide turning for home and ran down Ohio and Le Ken late to post his first win in four stateside starts. Most recently a close third in a one mile turf classified allowance here on Jan. 13, True Valor was off at 11-1 in a field of six older horses and paid $25.00, $10.00 and $9.20. Owned by Qatar Racing, Ltd., True Valour, a Group III winner going seven furlongs on turf four starts back in his native Ireland, improved his overall mark to 18-4-2-6. With the winner's share of $60,000, he increased his earnings to $235,112. Fresh off a minor stakes victory going one mile on turf at Turf Paradise Jan. 12, Brazilian-bred Ohio, ever game at age eight, finished a neck in front of Le Ken and paid $6.80 and $6.20 while off at 6-1 with Ruben Fuentes up. Argentine-bred Le Ken, who defeated the winner by a half length when second in a classified allowance on Jan. 13, was off at 22-1 with Tyler Baze and paid $9.20 to show while finishing a half length in front of River Boyne, who was full of run when he steadied a sixteenth of a mile out. Fractions on the race were 23.94, 48.52, 1:12.89 and 1:24.66. 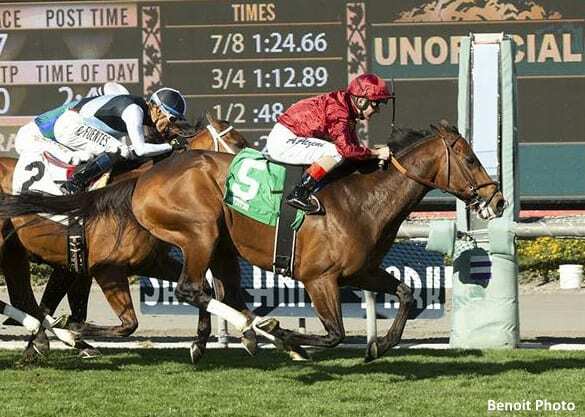 This entry was posted in NL List, Racing and tagged andrea atzeni, le ken, ohio, qatar racing, river boyne, santa anita, Simon Callaghan, thunder road stakes, true valour by Mike Willman/Santa Anita. Bookmark the permalink.